Sanam Jung is the leading model, VJ, actress and host. She was born on 30th September 1988 and she is now celebrating her birthday. She started her career as VJ in 2008 and she started her acting after completing her MBA. She has performed in various drama serials like Alvida, Dil e Muztir, Mohabbat Subh Ka Sitara Hai. Now she started hosting the morning show on Geo TV for few days, the she moved to Hum TV and started hosting the morning show, Jago Pakistan Jago. She was married with a flight instructor, Qassam Jafri. 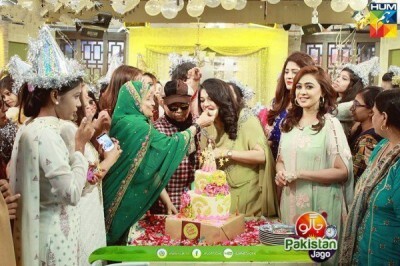 This was the first birthday of Sanam Jung after her marriage. 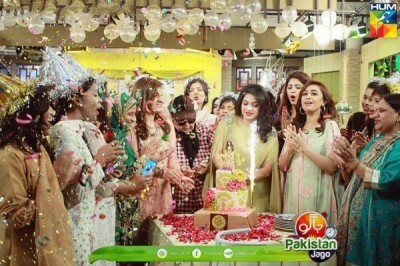 She celebrated her birthday in the morning show, ‘Jago Pakistan Jago’. 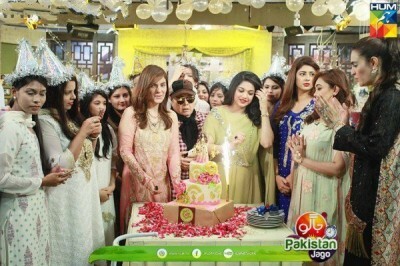 There are different pictures of her birthday celebration, which was celebrated in morning show, ‘Jago Pakistan Jago’.